And if you enjoy cereal, you probably are too. Do you find yourself grabbing handfuls of your favorite cereal or pouring yourself a bowl at all times of the day? If so, don't worry you're not actually a serial cereal-killer, more like a cereal addict! Some may say I have a slight addiction. I could eat cereal any time of the day with or without milk! I'm not discriminatory: I eat all types of cereal. I like the healthy variety and I enjoy the more sugary ones as well. I'm not really sure what the appeal of cereal is. I love the crunch, the taste, and the many varieties available. If I had to live on only cereal, I'd be totally fine! Below I have created a list of things that you can use cereal for and a list of cereals that are no longer available! Leave a comment and let me know what your favorite cereal is. My favorite is Waffle Crisp! Eating. This should be pretty obvious, if you have taste buds and like to eat things, you should probably eat some cereal. Snacking. Because eating cereal for one meal is never enough. You should always have a baggy full of your favorite cereal on hand. You'll never know when you'll need it to calm down a hangry (hungry/angry) co-worker or child. It might also prevent those embarrassing stomach noises your tummy makes when you're hungry. Breakfasting. We've all heard that breakfast is the most important meal of the day. Cereal can be a part of the meal that starts your day off right. Crafting. Who hasn't made a Fruit Loop necklace before? Not only is it pretty fashionable it can be eaten later if needed. Seriously though I'm sure Pinterest has some great cereal art ideas. Cooking. Rice Krispie Treats...no further proof is needed, but I'll provide some for you anyway! You can use cereal in a variety of different recipes. Crush it up and use it as a coating. Topping. Cereal can be used as a topping on everything from ice cream to yogurt. The texture adds a nice little crunch! I'm sure there are other great uses for cereal, but that's all I can think of right now. If I don't stop thinking of things, I'll have to stop writing and go get a bowl of cereal! Now it's time to move onto the cereals that we have lost. It's a real shame; there are some on this list that I never even got to try. This is list is not by any means complete. I just selected the cereals I have tried and the ones I would have liked to try. 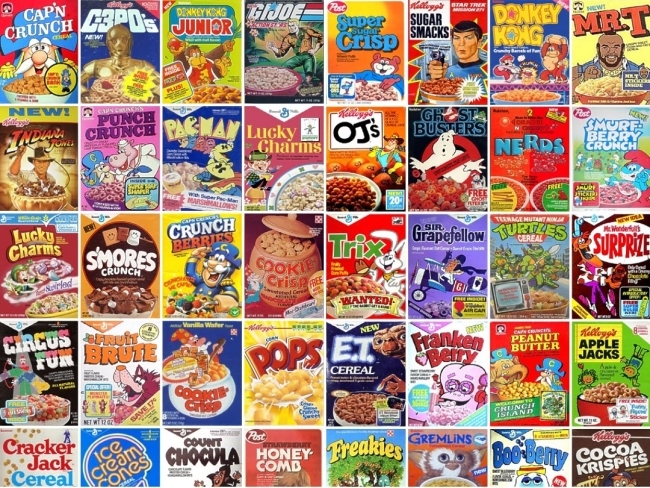 If there are any cereals on this list that are still available please comment below so I can go out a buy some!